PF.EFP (Grease Filling Pumps) | Products | Daikin Lubrication Products & Engineering Co., Ltd. The PF-1 type can be installed directly on 16 kg or 18 kg pail cans. These pumps can be used for filling gear cases or similar components with a large amount of grease as well as for filling tanks with grease. The pail can fit inside the tank of the PF-3 type as it is. 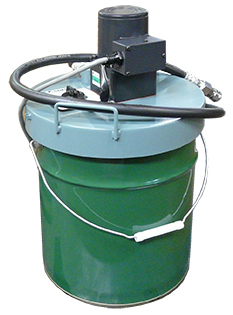 Labor during operation is considerably saved as all that needs to be done is to place the pump directly on top of a commercially available pail can (16 kg or 18 kg) and connect the power supply (100 V AC). Pump operation is automatically stopped when the desired operating time preset to the built-in timer is reached. This type greatly reduces actual working hours. *Be sure to use this pump indoors.